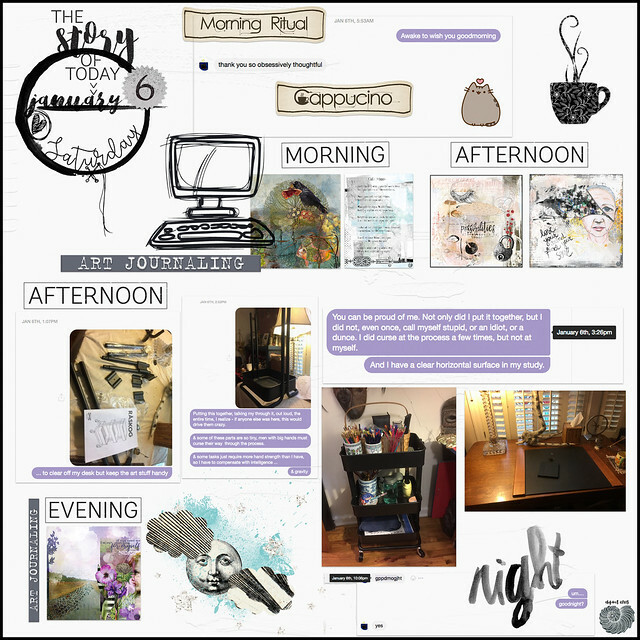 For the Month of Challenges at The Lilypad: January 14: Document Your Day (Random). Elements from FairlyFab, HeatherT, Dawn Inskip, Etc. by Danyale, Just Jaimee, Lynne-Marie, Pink Reptile Designs, Sabrina’s Creations, and Sissy Sparrows. The photos are mine. It happens that I documented this day in messages to my sweetheart, and I’ve included screenshots of those messages for the journaling. This was, obviously, an extremely productive day for me, five art journal pages and assembling an IKEA cart! If only every day could be this good . . .